The interior features a unique tri-cabin layout with large forward and aft staterooms and a spacious central salon, each with private access to an adjoining head compartment with shower. The forward, or master stateroom with ensuite head further utilizes virtually the full beam of the yacht to create an exceptionally open, roomy layout. A large double berth and chest of drawers and numerous other detailed amenities provide for a gracious lifestyle for extended periods aboard. Bright, open and airy best describe the inviting main salon. Large settees, a wide sole with retractable drop leaf bulkhead-folding table, pull out double berth and numerous stowage areas allow a variety of uses including gracious entertaining, dining or a third cabin for extra guests. The aft facing nav station is quickly accessible from the cockpit and allows ready communication with the helmsperson. The galley is aft to starboard with the enclosed guest stateroom with ensuite head and shower opposite to port. The engine is under the companionway with ample access from all sides. Headroom is 6'4". Large forepeak has overhead deck pipes, center divider w/attachment for rodes and a light...separated from forward cabin by a louvered access door. Forward head w/shower(drain to auto sump), w/curtain on track, teak seat, large vanity w/s/s sink, hot and cold pressure water with shower, unbreakable mirror, Formica counter w/teak trim, storage cabinets, two (2) opening ports and an overhead hatch, toothbrush holder w/cup, toilet paper holder. Forward cabin w/privacy doors to salon and head compartment. Large double Pullman type berth (offset to strbd.) w/full length teak shelf outboard, large stowage lockers under, nightstand, four (4) drawers. Generous cedar lined hanging locker with shelf over plus bureau with shelf over. Three(3)opening ports, overhead hatch, deck vents, teak and holly sole. Main salon w/pull-out double L-shaped settee berth to starboard, single settee berth to port, teak cabinets and book shelves outboard of both settees. Large stowage areas behind and under each settee. Cedar lined hanging locker with shelf over. Deluxe drop leaf table folds against bulkhead rack(with bottle stowage)to allow unobstructed use of the 4’ wide teak & holly sole. Large overhead hatch, numerous opening ports, deck vents, and overhead handrails. All the interior fabrics and cushions were new in 08 supplied by IP. Aft facing chart table/nav station to starboard (see below). Removable teak companionway ladder with engine access behind. Engine access also from both sides thru removable panels in aft cabin and galley. Storage rack for companionway drop boards. Center drop board fitted with fixed port w/etched logo. Molded nonskid cabin sole adjacent to companionway, galley and nav station, with draining grate in front of ladder. (Teak grate lifts out for dust pan and dust pan lifts out for bilge access). • Teak bulkheads, cabinetry, trim - select grain w/satin varnish finish. Navigation station with large table w/tray storage under nav light, two position table top, generous nav/electronics cabinet w/master DC/AC electrical panel plus room for a variety of owner installed equipment. Aft cabin w/privacy doors to main cabin and head compartment. Large double berth w/full length teak shelf outboard, stowage lockers under dressing seat. Generous cedar lined hanging locker w/shelf over, bureau w/shelf-over, two (2) opening ports plus overhead hatch, teak and holly sole. Aft head w/shower pan (drain to auto sump), shower area w/curtain on track, teak seat (seat retracts for access to marine head), large vanity w/ s/s sink, hot and cold pressure water w/shower, full length unbreakable mirror, Formica counter w/teak trim, storage cabinets, overhead hatch and opening port, toothbrush holder w/cup, toilet paper holder. Door conveniently located near companionway in main cabin plus additional door for private access to aft cabin. • Deluxe aluminum master electric panel w/four way battery switch, circuit breakers for 12V DC and 115V AC systems, AC and DC gauges, battery test system, reverse polarity protection,indicator lights, hour meter, elec. pump controls, LPG control, battery charger control. • Sound insulated engine compartment w/access from sides and forward. Hull color is the standard Island Packet ivory white w/red bottom paint (new 9/07). The underwater configuration is a full keel with attached rudder. hand laid fiberglass construction throughout with ISO/NPG type gel coat for maximum durability...Hull molded in one piece with extra strong triaxial glass, unified with an engineered molded interior grid structure... Deck laminate cored with advanced "Polycel” - a tough microsphere and resin matrix that is heat, rot and delamination proof ...Deck attached to integrally molded hull flange with bolts, lock nuts, and urethane adhesive sealant...Deck hardware thru-bolted with aluminum backup plates...Two-tone deck - low-glare ivory white w/molded nonskid (premium coarse diamond pattern)...Teak rub rail, cap rail and bowsprit platform cap with s/s striker...contoured cockpit seats (7’ long), coaming storage boxes, seat locker and tray...Molded fiberglass sliding companionway hatch w/sea hood, inside latch and exterior hasp...cockpit scuppers. Built in Florida, this long range cruiser has been the traditional favorite of all of Island Packet's popular designs. The 38 was offered from 1986 to 1993. Valhalla is owned by this, her second owner. She has always been a Chesapeake Bay based yacht which belies her capability to cruise anywhere in the world. Not only are these 38s well constructed and sea kindly, but the spacious accommodations allow cruising in true comfort. Valhalla has had a history of excellent maintenance by both owners. She recently has undergone complete refinishing of her exterior teak. She has had the topsides compounded and wax, the bottom freshly painted and she is ready to go cruising. 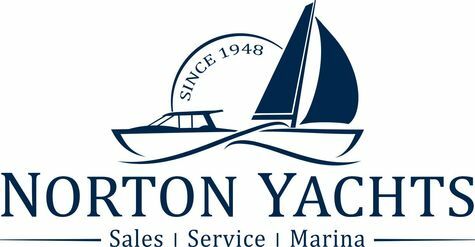 Andre Båter fra Norton's Yacht Sales, Inc.
Vis alle Båter fra Norton's Yacht Sales, Inc.